Many people are drawn to A frame log cabin kits because of their unique aesthetic, and whimsical interiors. Given their name because of their distinct peaked roofs that form an “A” shape, these homes were originally constructed to withstand the heavy snow loads of alpine mountain ranges. As modern home-building technologies have improved however, A-frames have become much more of stylistic choice than a functional one. Over time, several iterations of this original design concept have emerged. The “arched cabin” design is slightly different, but maintains the same design concept, and a similar look. In addition to cabins, people are also now building A frame houses in the city. 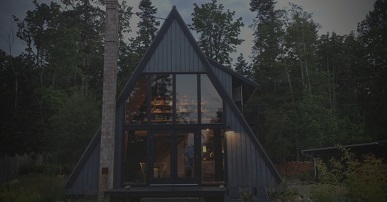 If you are wanting to build an A-frame cabin from a kit, you are in luck. Several manufacturers offer A-frame log cabin kits. If you are considering this, keep in mind that for as cool as they may look, A-frame design seriously cuts down on usable space. You will have sloping ceilings in every room. While that looks cool on Pinterest, it takes some patience and creativity to make a functional living space. How Much Do A Frame Cabin Kits Cost? The first thing that most people wonder when they are looking at A frame cabin kits for sale, is “how much do they cost?” Obviously it depends. Size, materials, blah blah blah. The short answer is that you can find bare bones models that are just a couple hundred square feet for under $15,000. Many of these are without kitchen amenities, bathrooms, or bedrooms. Obviously kits like this are really only suitable for a pretty limited number of use cases (think single people, overnight vacation stays, etc). Nicer and more “liveable” kits can be had for $25,000 – $50,000. The kits that most people will ultimately want usually fall within this price range. The higher end of A frame kits prices are up above $100,000, much more on par with a normal house price. If you’d rather not lift a hammer to build your kit, but would like to benefit from the cost and time savings of a templated kit, it is possible to purchase a prefab A frame kit. Like other prefab cabin kits, they are manufactured off-site, and then shipped to your location in several pieces. There they are reassembled by a team of professionals, to become your finished cabin. Obviously, if you aren’t interested in a kit, it’s possible to to purchase plans for an A frame house as well. Find a design that you like, get the plans, and then hire a contractor or build the house yourself. If you are confident enough to go this route, it can mean a substantial cost savings for you and your family. The downsides of course, are that it will likely take longer to build than a prefab cabin, and that you won’t have the same “guardrails” that you would if you were building from a kit.